Some 17,000 education and training places could go as a result of severe cutbacks, the Department for Employment and Learning has revealed. It means that 1,500 jobs are at risk: 650 in higher education, 500 in further education and 400 civil servants. 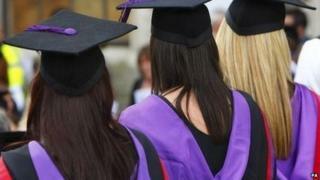 About 1,000 places may be lost in universities but 16,000 would go from further education colleges. The department is being asked to cut £82m or 10.8% from its annual spending. Employment and Learning Minster Stephen Farry said the level of cuts proposed was "unprecedented". Mr Farry said: "This document outlines the possible impact on a wide range of functions and services across the department and arms length bodies in response to the executive's draft budget. "The level of cuts being proposed for the department is unprecedented and this will have far reaching and deep implications across all of the department's provision. "The potential measures will impact on the universities, colleges and other sectoral training providers and will almost certainly result in a reduction in places offered to train and educate our young people." The news comes a day after a senior official in the Department of Education predicted at least 2,500 job losses in schools over the next financial year. The proposed cuts at the Department for Employment and Learning are contained in a draft savings plan that sets out the impact the 2015/16 budget will have on the department. To date, the department has decided upon reductions of less than half of the required £82m. BBC News NI education correspondent Maggie Taggart said: "Some 17,000 fewer places in colleges and universities would be extremely damaging to the prospects of young people. "71% of the department's budget goes on staff costs and more than 1,500 jobs are at risk." Mr Farry has also decided to take more than £2m out of the budget for smaller teacher training colleges - a 20% cut. "It is the money St Mary's and Stranmillis currently get because of their small scale," said our education correspondent. "He says the payment called the 'premia' does not contribute to front line training and if he did not remove it , he would have to make even steeper cuts." NUS-USI president Rebecca Hall said the ramifications for students could be catastrophic. "Government must make investing in our future a key priority. That means investing in students and in further and higher education," she said. "Government simply must overturn the proposed cut to DEL funding within the draft budget." A senior official in the Department of Education has predicted at least 2,500 job losses in schools over the next financial year because of cuts. Trevor Connolly described the situation as "extremely bleak and difficult". Mr Connolly said 1,000 teaching jobs and 1,500 non-teaching jobs could be lost and that that figure could rise. He said schools budgets could also be cut. The Department of Education has to make cuts of £198m to its budget. Mr Connolly made his remarks when he was giving evidence to the Education Committee at Stormont. The draft budget is out for public consultation until the end of the month. The assembly will debate the budget next month.